FIGS. 17-20. Petioles of Dracontium. 17. D. gigas (Zhu 1159), showing the petioles often mottled in a serpentine pattern. 18. D. gigas (Zhu 1156), petiole longitudinal section showing aerenchyma cells. 19. 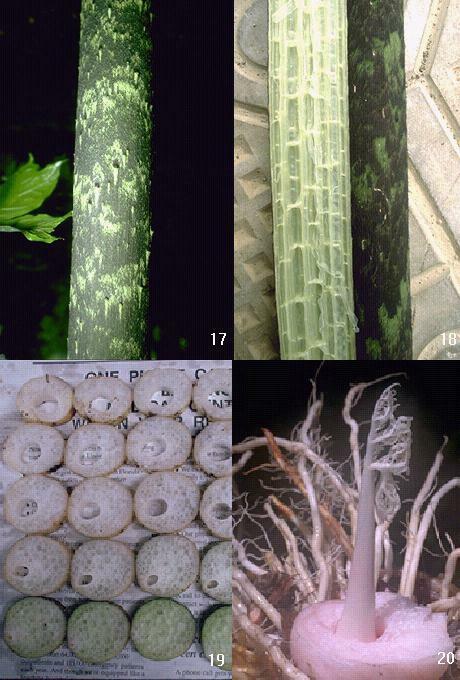 D. gigas (Zhu 1159), basal cross- sections showing the hollow space where inflorescence or new leaf starts to grow. 20. D. grayumianum G. Zhu (Zhu 1506), showing new leaf development inside petiole.